After a year of sickness and the past 2 months spent in the hospital, my grandma went to be with the Lord this morning. She waited until 1:00 am the day after Christmas to go to Heaven, her last selfless act. I am sure she waited so she would not disturb anyone’s Christmas plans. The past couple of months while Grandma has been in the hospital and I have been anticipating this moment, I have been reflecting on her life and the lives that have been impacted by her. 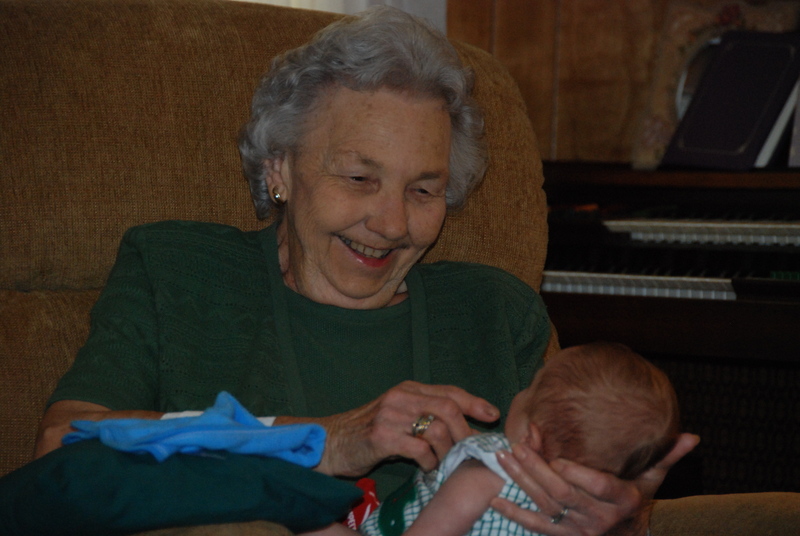 In her 88 years on earth, Grandma was a shining example of what I consider to be a Christian woman. She loved Jesus and that was evident in her everyday actions and words. I love reading about the Proverbs 31 woman in the Bible. I study that chapter in the Bible and try to live my life like her, and I have to keep in mind that the woman described in Proverbs 31 spent her entire life doing everything that is told in that chapter. She couldn’t have been all of those things at once, and neither can I or any other woman, but I hope that by the end of my life I will have at least gotten close! Reading through Proverbs 31 this afternoon, I realized that Grandma has done it! She has been the Proverbs 31 woman. Anyone who thinks of my grandma thinks of my papa. She loved him with all of her heart, showing him graciousness, forgiveness, love, kindness, understanding and support for their entire life together. Her love for Papa exemplified what a true servant’s heart should be. They are in Heaven together right this minute, and I know she isn’t looking back. Grandma was a hard-working woman. She worked her entire life doing different things for her family, and she didn’t whine or complain about it. In fact, her only complaint was when she could no longer work! Grandma loved cooking for the family, and a lot of my childhood and adulthood memories center around eating at Grandma’s. She always had something to eat, even if it was peanut butter crackers! She made the best sweet tea in the world, and it will never be replicated. Grandma loved canning beets, pickles, green beans, vegetable and tomato soup, tomatoes, and tons of other things. Her basement is full of canned goods as we speak, and she always made sure to send me home with some canned foods (But watch out if you didn’t return her cans!). Grandma always had a clean house. That was important to her, and she worked hard at it. Grandma worked hard for her family and for other people, never thinking of herself or her comfort. Grandma and Papa were certainly both well-known for their many precious qualities. They were leaders in their family, which is most important in this life. Strong and dignified are the perfect words to describe my grandma. She possessed those 2 qualities that a lot of women today lack, and she instilled them in her children and grandchildren. Grandma laughed without fear of the future until the very end, because she knew that her future would be in Heaven. I know that is what she wants for every one of us here mourning her now. Grandma was so wise. She knew so much, but most importantly she knew about a woman’s instinct and its importance. She was always willing to share her knowledge and advice, but not unless it was asked for, and always with love and kindness. I could call her up to find out about a recipe or for advice about the kids, and she would always stop whatever she was doing to talk to me. There are so many wonderful things I could say about Grandma, but what stands out the most as I look back on my time with her on this earth is that she showed us a glimpse of God’s love for us. God worked through Grandma for her entire life, and that is all any of us can endeavor for. I am so very sorry for your loss!! She sounds like an amazing woman!! What a testimony her life has been to a loving God! Prayers for all of you. Thank you for your prayers, Amy! I read this and I cried. Then I read it again and I cried some more. Then I read it again and, well, you get the picture. Beautifully written Laresa. It is the perfect description of our Grandma. I cried the whole time I was writing it. The kids think I am a blubbering idiot. Yeah, I started crying and Emma threw her toy at my head. Not sure what she was trying to tell me. haha! You know, it is never easy when we lose a loved one. But we can rest assured that they never really leave us. Take care.